I was going through my other blog (have not posted anything there for a long, long time) and thought you might enjoy a post from It once in awhile. It is Pieces of the Past and full of stories about my family and my husband's family and lots of our ancestors and also our children. This is one about things I remember from my teenage years and it was posted September 18, 2009. Amost the same age as Shirley Temple, I was one of those little girls who had poker straight hair and that was just not right! Permanent waves were the answer - my very first one was from this torturous contraption where your hair was wound on rods and then clamps with wires attached were clamped down on the rod. The beautician put pads under and around everything and when the thing was heating she would fan the hot spots. Can you imagine? Beauty must suffer! I think they were actually pretty good perms, though. Then I spent lots of time "putting my hair up" which was winding it in pin curls and securing the curl with a bobby pin. Why, oh why, did we not have the freedom of having straight hair? There are so many ways we think we should be or how we should look - it's a puzzlement. While the pincurls were drying, I wrapped a bandanna around my head. 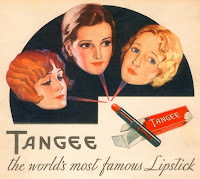 Now here is something all of the young teenage girls loved - Tangee! It was orange - really orange - but it turned pink when you put it on your lips. For some reason, that was the first lipstick for all the girls. I can still almost taste Tangee and feel it's waxiness on my lips. And the wonderful little blue glass bottle of Evening in Paris with the pretty tassel. How wonderful it smelled. I felt so happy when I had one of these. Another fun aroma was Lily of the Valley. All of these delights could be purchased at the local dime store for not much money - which was good since there never was much money to be had. Do you know what, though? The good old days were really pretty darned good - in fact, it's very good looking back on them and remembering. I was so envious of those curls--my hair is stick straight and a perm would turn my hair into a red ball of frizz--in fact I remember being teased about my perm and being called "Karen Carrot Top". I was sad to hear today that Shirley Temple had passed away. I still enjoy her films and she was a great lady! I have one of those blue vials minus the tassel!My son found it in the Mississippi River. Makes me think there's a story there! Straight brown hair and first perm was on one of those machines! I hoped that in case of fire, I could unplug it and roll it outside. And it did get hot!! Torture.